If the splendid ocean views and beauty of the Santa Cruz area whets your appetite for adventure, head inland just a few hours, where some of California’s best whitewater rivers await. Intermediate trips are available on the Merced River. Class IV rapids and rolling wave trains create nature’s roller coaster east of Santa Cruz. East of Santa Cruz, the Tuolumne River canyon offers two options. The Main Tuolumne River is a beautiful Class IV river. One, two and Three day trips available. 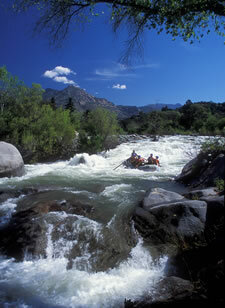 The Upper Tuolumne / Cherry Creek, is the ultimate in Class V whitewater.